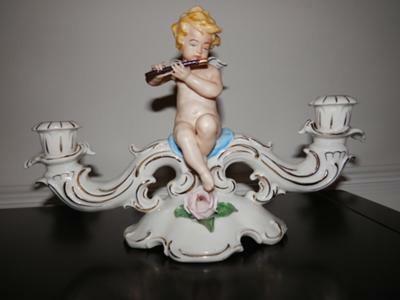 I have a twin branch German porcelain candelabra with a seated cherub playing a flute at the center with a pink rose at its feet. 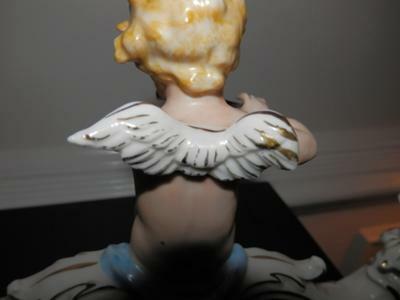 The wings on the cherub’s back are asymmetrical; I thought it might have been damaged and repaired, but it appears to be original. 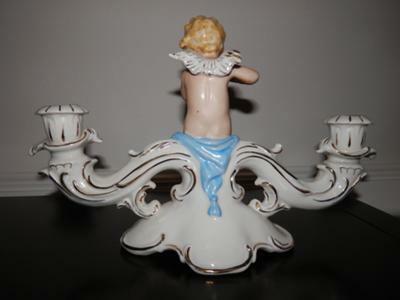 The German porcelain candelabra is 6.5 inches high and 9.75 inches wide. 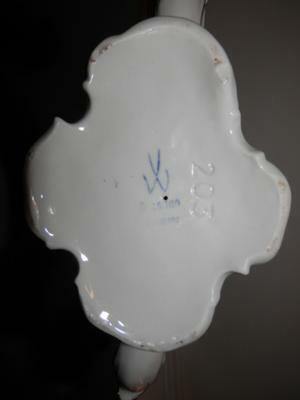 It is marked “Dresden” above “Germany” in blue on the bottom, faded but legible, with what appears to be crude crossed swords mark, although more like crossed check marks or a letter “V” over “W”, also blue. It also has the number “203” on the bottom. This came to me in my mother’s estate. She probably bought it in Germany in the early 1960’s; my father was stationed there in the Army. I don’t know what she paid for it but would love to know more about this German porcelain candelabra and possibly a valuation. Hi, I also have one of these. Did you ever find out the value? If so maybe you could mail me at mikesimm AT blueyonder.co.uk to let me know.